The countdown has started until we see Megan again. Today is 21 days. Hopefully the time will go by fast. We did talk today on the phone. That always makes me feel good. I created this simple card today. Out came the Rooted in Nature Bundle. It's hard to see, but the tree is stamped with Versamark and embossed with the Copper Embossing Powder. It's so easy to do, but packs a big impact. I tried doing the words the same say, but I had trouble reading all the words. Instead, I used Tranquil Tide. On the Soft Sea Foam, it looks great. 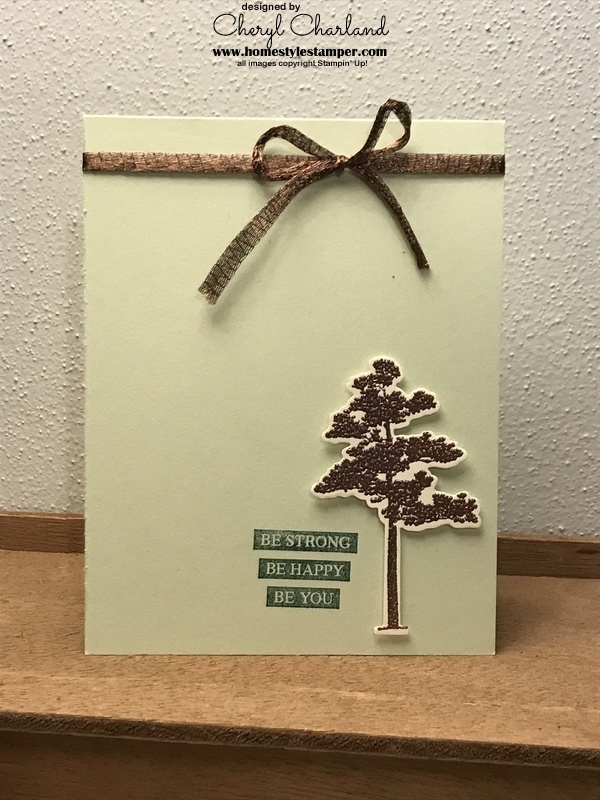 A simple ribbon at the top, and your card is done. Soon the retirement list will be coming out. That's always a sad day. That means the In-Color from 2018-2019 colors will definately be on that list. If you want any markers, ink pads, ink refills or cardstock I wouldn't hesitate to place an order. Once we sell out of those items, they will be gone.